It was strangely quiet on the Friday night before the Montreal Mini Maker Faire. 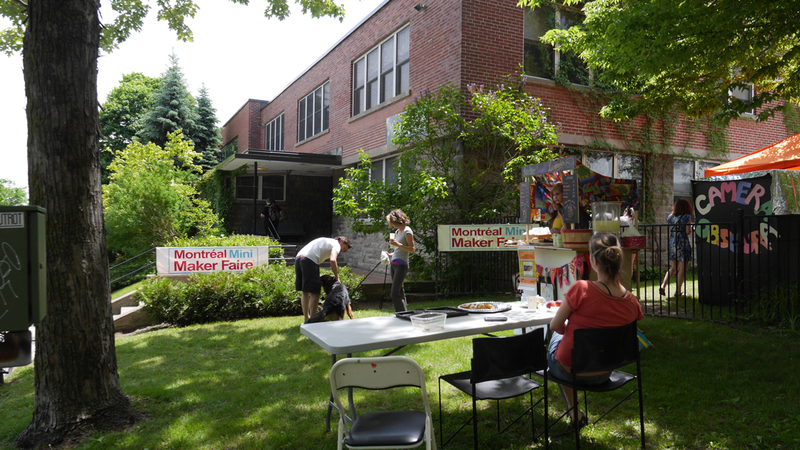 The maker participants who chose to set up before Saturday morning were going about their business. The volunteers were putting up signs and moving tables. If you didn’t know Dannielle Dyson you might guess she was the one multi-tasking and moving a bit faster than the rest, She still remained quite calm and focused on the tasks at hand. Dannielle is the director and founder of MMMF. This was the second year of operation and the event in 2012 was at the Olympic Stadium. Doing it at a community centre was quite a bit different but something that worked in its favour. I knew I wanted to interview her but Friday night was not the time. I got her to share her thoughts on Saturday only after she helped set up the lunch for volunteers and makers. One of the things I value in the whole maker movement are the initiatives that focus on young people. There is a group in Ottawa that had a booth at the Faire that is trying to inspire kids by combining traditional arts and crafts materials with electronic technology. I had a chance to speak with Alison Evans Adnani who is the founder of Maker Junior. Here is what she had to say. In the video about the event itself I focused on three makers who were there for the first time. It is exciting to find people who see their participation as a way to get feedback or renewed energy to continue their projects in the future. So now that this event has concluded, I have got a few things myself to do in the basement or if the weather holds up, outside. This entry was posted on Friday, June 20th, 2014 at 5:23 pm	and is filed under Musings. You can follow any responses to this entry through the RSS 2.0 feed. You can leave a response, or trackback from your own site.